At chili parlors in and around Cincinnati, "coney" is a nod to a Coney Island hot dog, though more in name than in presentation. 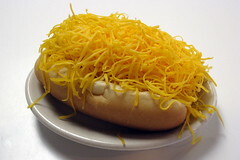 The default version includes mustard, chili, and diced onions on a very soft steamed bun; a cheese coney ($1.65) hides any trace of the wiener under shredded cheddar. 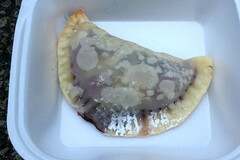 Once a month you can find them in Manhattan, too, priced accordingly. "Fatira" is a name applied to many varieties of Middle Eastern pastry, both savory and sweet. When a U.S.-born Palestinian chef applies her talents to the bounty of Midwestern farmers markets, a blackberry fatira ($2) is one happy result.